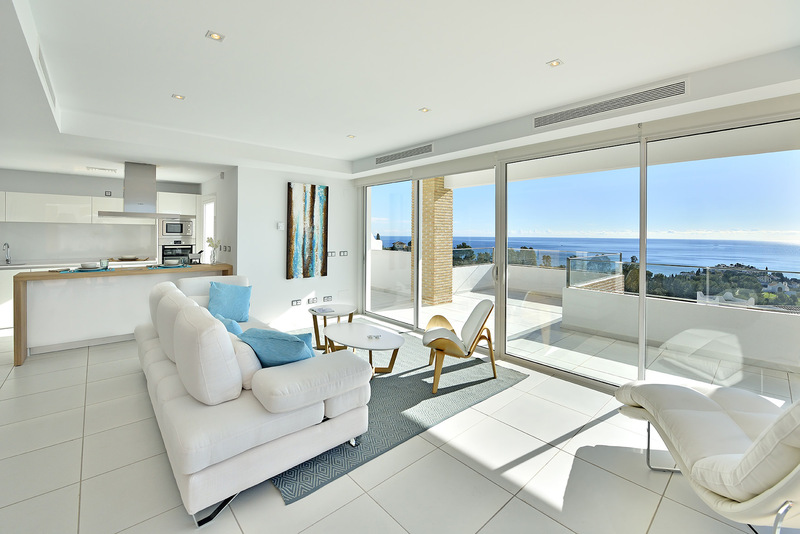 New modern villas overlooking the Mediterranean Sea , located in a residential complex near to the coast of Benalmadena. Its pristine location offers unparalleled panoramic sea views over the Mediterranean and entire Fuengirola bay.Walking distance from the beach, the train station of Torremuelle, and the charming town of Benalmadena. Large homes with 265 usable square meters, distributed in three levels. Living /dining room with integrated kitchen and spacious terraces with breath taking sea views. 3 bedrooms with in suite bathrooms and the master bedroom on the upper floor with walk-in closet and access to a private terrace. On the main floor is the living/dining room with integrated kitchen and seamless connection with a wide terrace, guest bedroom with in suite bathroom and a half bathroom. On the lower floor there’s a 40 square meter living room with access to a private garden, and two bedrooms (one with in suite bathroom). Each home comes with garage or carport and pre installation of a lift which can be fitted as an extra. This project is currently under construction and near to completion. Come along to see the show house !!! Prices start from €629,000.